One great aspect of construction and remodeling is the amount of technique and perfection that goes into creating something. However, we didn’t just learn those skills overnight. It took time to refine our understanding of how to build and create with our hands. If our ultimate goal is to lead our teams or organizations to success, it has to start with ourselves. In order to be a leader within the industry, we must have a BURNING desire to continuously improve ourselves. An organization will go nowhere if leadership is stagnant. So how do I ensure the growth of my team or company? When I began leading project teams on complex projects, I focused on improving my own skill sets. By doing this, I was able to train and develop my team members to become the most effective and efficient employees in the entire organization. As you continue your cycle of improvement, your organization becomes a force to be reckoned with and it all starts with you. Start by developing a new skill or enhancing a pre-existing skill. Sometimes this comes very natural to some and not to others but let’s take a look at the 4 steps Dale Carnegie taught us about the cycle of performance improvement. get past this “motivational gap”, you must dig deeper than ever before and find whatever drive and desire you have. Believe in your growth and your future. This is what separates the goods from the greats. 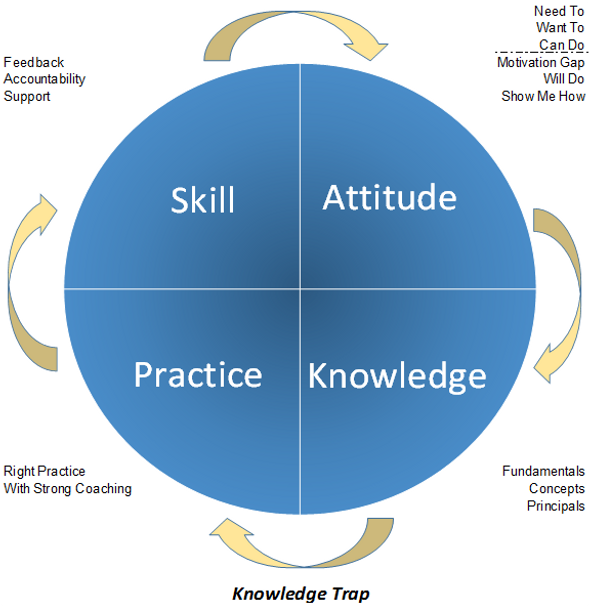 Knowledge Trap – Be careful not to fall into the knowledge trap. This is where we continuously learn but never put what we have learned into practice. 3. PRACTICE – Were you a pro the first time you installed sheet rock or built cabinets? Absolutely not! Whether it’s laying tile, improving customer service, or motivating your team, it takes practice. The key is practicing the right way. Find a coach or a mentor that can help you practice the RIGHT way. Don’t develop bad habits and immediately kick the ones you do have. 4. SKILL – Once you have practiced and refined that new skill through feedback, you can then add it to your skill set toolbox and use it in your day to day activities. In addition, you now have the knowledge to pay that skill forward in order to help your team learn and grow. Remember continuous improvement takes commitment, time, and is a continuous cycle. I believe you have what it takes and so should you! Which skill are you most excited to begin improving on? What methods do you currently use to improve yourself and others? If you know someone who would find this helpful, pass this post on! First time here? Subscribe to Buildaga and receive industry relevant content, tips for building your brand, and tools for expanding your footprint.